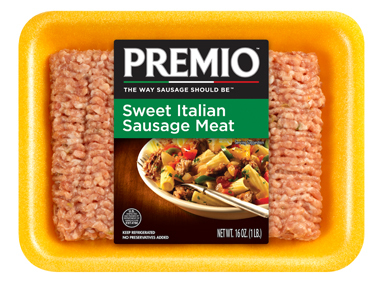 Get the Italian flavor you love packaged differently with Premio Sweet Italian Sausage Meat. Add something special to your meatloaf, meatballs or burgers without having to deal with casings or crumbling sausage. Once your family smells the delicious aroma of this versatile meat, they’ll be at the table long before you ring the dinner bell. Find the Premio retailer closest to you now and make magic happen in your kitchen. Ingredients: Pork, Less than 2% of the following: Water, Sugar, Salt, Spices (including fennel & black pepper), Potassium Chloride, Paprika, Natural Flavors. Heat a pan to medium temperature. Add 2 tablespoons water, vegetable or olive oil and place in pan. Cover the pan, continue heating approx. 8-10 minutes, breaking up meat with fork as needed. Remove cover and continue cooking until golden brown, approx. 15-17 minutes. Add to your favorite recipe and enjoy! Cover or place in a closed container. Refrigerate and serve within 2-3 days. Heat approximately 1 minute on high or until warmed to your satisfaction (adjust time according to your microwave). Always cook sausage meat to 160 °F. Premio’s signature Italian flavor, but in meat form! With its impeccable taste and many forms, there’s an unlimited number of things to do with it! Try Premio Sweet Italian Sausage Meat in Italian Meatball Soup, our very own Premio Mild Sweet Sausage Stuffed Jalapenos, Beef & Sausage loaf or a bursting-with-flavors Zucchini a la Puttanesca. The Italian Sausage Meatball Soup is delicious with Premio Sweet Italian Sausage Meat, too. The aromas from the herbs and spices will whet everyone’s appetite long before the soup is served! Sometimes you want the great taste of Premio Italian sweet or mild sausage, but you don’t necessarily want it in the typical way. Sausage links are great, but they’re certainly not the only way to enjoy sweet Italian sausage meat. Maybe you’re in the mood for patties but you want to make them yourself, the exact shape and thickness you like, the opportunity to feel that sweet Italian flavored sausage meat in your hands as you craft it into the perfect patty. Or maybe you’re in the mood to make sausage meatballs out of your sweet or mild Italian sausage meat. When you buy packs of Premio Sweet Italian Sausage Meat, you’re in total control. You get to decide how you and your family will enjoy this delicious treat. Your family loves it when you make homemade hamburgers, so why not make homemade porkburgers with sweet Italian ground sausage meat and all the amazing flavors that come with it? The aroma of those burgers sizzling on the grill might bring neighbors in from miles around, not to mention the effect it will have on your immediate family! One of the great things about sweet Italian sausage meat is that it’s so versatile. Although it’s an Italian delicacy, you can use it to make tacos, burgers and dishes from a variety of international cuisines. There’s no shortage of Italian recipes that are a great fit for sweet Italian ground sausage meat, however. You can enjoy it in calzones, on pizza and, of course, with pasta. Here’s a fun sweet Italian sausage meat spaghetti dish you can prepare for your family as soon as you pick up your Premio Sweet Italian Sausage Meat. Just take one sixteen-ounce package of spaghetti, one pound of Premio Sweet Italian Sausage Meat, half a chopped onion, half a chopped green pepper, two tablespoons of margarine, a 14.5-ounce can of diced tomatoes, a six-ounce can of tomato sauce, a half-teaspoon of Italian seasoning, a quarter-cup of grated parmesan and a quarter-cup of shredded mozzarella. Boil a large pot of lightly salted water. Cook the spaghetti for about 12 minutes and drain. Then brown the sausage meat on your skillet over a medium-high heat until it is crumbly and brown. This should take about five to seven minutes. Discard the grease. Stir in your onion, bell pepper and margarine. Reduce heat to low, cover and cook for about five minutes. Now stir in your tomatoes, tomato sauce and seasoning. Bring to a boil and stir in your Parmesan cheese. Pour your sausage meat sauce over your spaghetti and top with mozzarella. This recipe couldn’t be easier, but it’s a big family favorite. Use our store locator to find where our Italian sausage is sold near you!